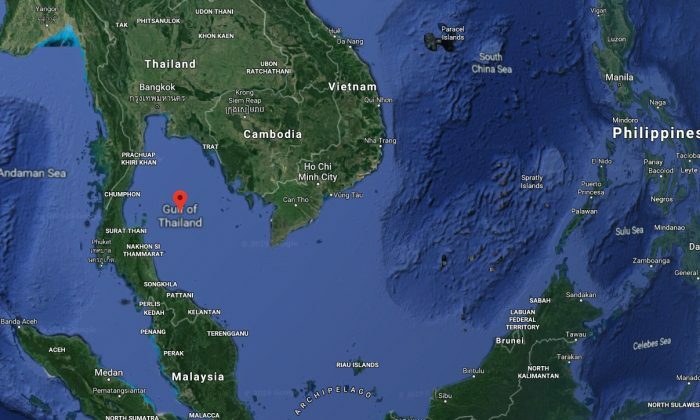 An exhausted dog was pulled to safety by oil rig workers who spotted it swimming in the Gulf of Thailand, 135 miles from the coast. The moment the dog crawled onto the rusty bars of the rig were captured on video, after workers had called out to her as she swam towards them. The video was posted Khon Vitisak, who rescued the animal and now hopes to adopt it—if no one steps forward to claim the brown Aspin. She has now been taken ashore to a vets who gave her a clean bill of health. “After she made it onto the bars below the rig she didn’t cry or bark at all,” he said. The workers looked around for a way to help her up, and decided to use a rope to pull the dog to safety. At first, the aspin was drained and listless, exhausted from being in the water for so long. She was also dehydrated, according to Vitasak. Turning to social media for advice, they then gave it water and minerals. The dog soon perked up and started to sit up and walk normally, he said. By the time the dog had made it to shore a few days later, it was already a viral celebrity, with Vitisak’s video of the rescue having been viewed over 1.4 million times. The dog stayed on the drilling platform for two nights while a special cage was welded together and staff gave it food and water. The charity, Watchdog Thailand, then took it to a nearby veterinarian in Songkhla, southern Thailand, on April 15.